Although Arthur George Hammond was born on the 28th September 1843 in Dawlish, Devon, his birth, for some unknown reason, was not registered with the authorities. He was though, baptised in Dawlish on the 25th October 1843, the baptisimal record confirming his date of birth as above. When Arthur joined King Edward VI School, Sherbourne, Dorset, the Hammond family followed. Upon completion of his education at Sherbourne, he was accepted and entered Addiscombe College, the training college for entry into the Indian Army. 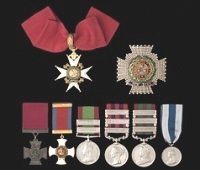 He was nominated by Major-General Sir Robert Vivian, KCB, and received glowing references from the headmaster and vicar of King Edward VI's school. His cadetship in Addiscombe college was short, entering in January 1861 and ending when the college closed in August 1861 following the British government's takeover of the HEIC ( Honourable East India Company ) and its army, after the Indian Mutiny of 1857-1859. 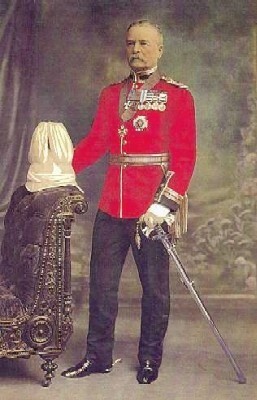 Arthur Hammond first joined the 82nd Regiment ( Prince of Wales's Volunteer Regiment ), before being posted to the 12th ( Kilat-l-Ghilzai ) Native Infantry in India. He then joined the prestigious Bengal Staff Corps and the Queen's Own Corps of Guides, part of the Indian Army, with whom he spent the rest of his military career. Hammond, as a 2nd Lieutenant in 1861, took part in most of the major campaigns that occurred in India at the time eventually reaching the substansive rank of Temporary Brigadier General in 1891. Following his illustrious military career, Arthur Hammond retired to his house, Sherbourne House, in Camberley, Surrey, which no longer exists. He died on the 20th April 1919, aged 75 and is buried in St Michael's Churchyard, Camberley.